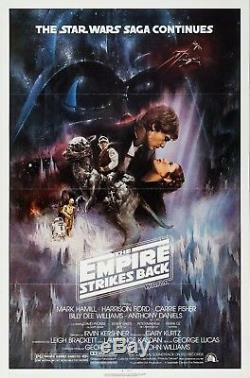 The Empire Strikes Back (1980). Mark Hamill, Harrison Ford, Carrie Fisher, Peter Cushing. Original one-sheet style A movie poster. Canceled "Gone With the Wind" style. Condition: near mint and unused. The item "THE EMPIRE STRIKES BACK (1980) ORIGINAL MOVIE POSTER STYLE A TRI-FOLDED" is in sale since Friday, March 31, 2017. This item is in the category "Entertainment Memorabilia\Movie Memorabilia\Posters\Originals-United States\1980-89". The seller is "moviepostercenter" and is located in Victorville, California. This item can be shipped worldwide.